Millennials have already lost so much: A relatively secure housing market, the hope of stable careers, and an Earth that wasn’t completely littered with the mistakes of Baby Boomers. So when Pluto was demoted to a dwarf planet in 2006, it was another nail in our fragile hearts. But that hasn’t stopped astronomers of all ages debating about whether or not Pluto—and other objects in our solar system—are, in fact, planets. Pluto could be a planet, because the very word “planet” is kinda ¯\_(ツ)_/¯, even for experts. Today, planetary geologist Kirby Runyon will present a new definition of “planet” at the 48th Lunar Planetary Science Conference in The Woodlands, Texas, undoubtedly rekindling the flames of controversy. Runyon’s definition does away with a key International Astronomical Union (IAU) requirement for planethood—namely, that the object is massive enough to clear the neighborhood around its orbit. Instead, it focuses on the geophysical properties that set planets apart from smaller and less complex objects. 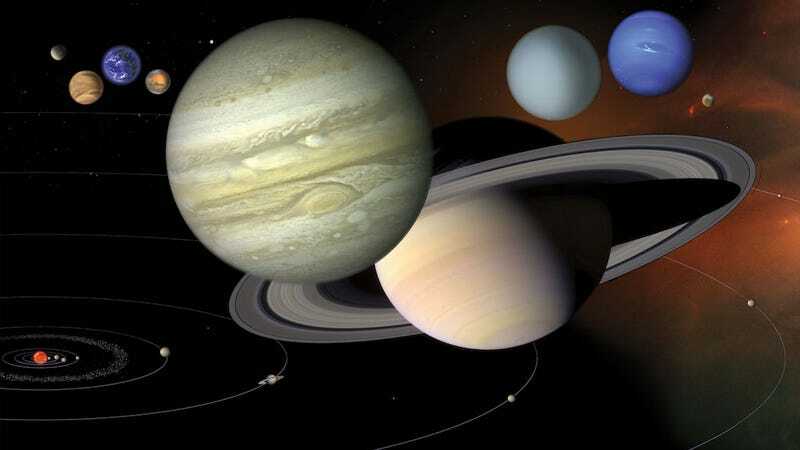 A planet, according to Runyon, is “A substellar mass body that has never undergone nuclear fusion and that has enough gravitation to be round due to hydrostatic equilibrium regardless of its orbital parameters.” By this definition, many moons in our solar system—including our own—would be reclassified as planets. Runyon’s definition could be a game changer for a few reasons. From a scientific standpoint, it’s much more inclusive than the IAU’s, meaning there would be a lot more planets in our Solar System—more than a hundred. He hopes this system would promote a different way of learning astronomy, one that focuses more on concepts and less on memorizing arbitrary celestial objects. From a public interest perspective, Runyon’s argument gets at the crux of this debate—that perhaps, the glamour and gravity of the word “planet” bolsters the case for sending a mission to explore it. But again, this idea could also be ¯\_(ツ)_/¯—regardless, Gizmodo has reached out to Runyon for comment. Some scientists assert there’s absolutely no confusion about the definition of a planet. Caltech astronomer Mike Brown, who famously helped demote Pluto with his discoveries of other large Kuiper Belt Objects beyond its orbit, told Gizmodo that the planets in our own solar system don’t require much back-and-forth debate at all, and a cursory glance at our current planets proves this. Brown advocated for Pluto’s demotion to dwarf planet status on the grounds that it does not clear its planetary neighborhood of objects in the Kuiper Belt. The decision was met with instant controversy that hasn’t entirely quieted down—Brown admits that he receives hate mail about it to this day. Naysayers aside, he maintains there’s a good reason to classify planets according to the IAU’s current model. Above all, Brown’s not sold on the idea that granting something planetary status makes it more important. “That is not a good reason to have the definition of planet—that’s a good reason to have a better PR person,” he said. But the fact remains that there is a certain gravity (no pun intended) to granting something planetary status. While astronomers and planetary scientists are keen to explore moons like Enceladus and Europa because of their potential to support alien life, these aren’t objects kids in grade school are usually learning about in their science classes. Would that change if we called them planets? Weintraub asserts that for better or worse, vocabulary “drives the way we think about things,” in this case, about planets. Runyon’s definition wouldn’t necessarily negate the IAU one. But it would offer an alternative that could help astronomers and educators convey why lesser-known celestial objects—ones that we don’t have mnemonics to memorize—are just as interesting as Jupiter and Neptune. So, why not both? What Are Planets? What is Reality, Even?